Update: Be sure to see Jared Stein's comments on the post that started this convo, and KUDOS to Instructure for being the kind of company that participates in public discussions. That is something I do think is awesome! Okay, I'm going to set a 15-minute timer on this one because writing up ideas on how to improve an LMS is not my favorite thing to do, but I feel obliged to respond to Matt's invocation of FERPA as a reason why the Canvas notifications have to be so terrible. Ironically, just this week Jim Groom wrote something about The Schizophrenia of Outsourcing EdTech (and "all the energy expended conjuring the evil spirits of FERPA to prevent anything interesting from happening on campus when it comes to edtech and the web"), and he's written about it before, years ago in fact: You can't spell FERPA without FEAR. I did a stint working for my campus IT, so I know something about FERPA, and I also know that compliance with FERPA is not the reason why we can't have nice things in online learning. 2. Again, within institutional and instructor constraints, students should be able to choose additional notification channels, such as SMS and Twitter, etc. They should be able to turn channels on and off, and configure the channels for different granularity (i.e. notification if new post to discussion board, notification if new reply to me at discussion board, etc. etc.). 3. Again, within institutional and instructor constraints, students should be able to choose a display name within the system (which might be their real name, or a nickname, or it might be a pseudonym) and, if there are communications going outside the system which will contain their name, they should be able to choose a display name for external communications (which, again, might be a nickname, or pseudonym). If they want; my guess is most students will opt for same internal and external. And most students will opt for real name (or real nickname). But that should definitely be their choice. 4. Again, within institutional and instructor constraints, students should be able to choose a display avatar for within the system (which might be a personal photo or some other graphic image) and, if there are communications going outside the system which will display the avatar, they should be able to choose a different avatar for external communcations. If they want; my guess is most students will opt for same internal and external. As for using a personal photo or not, with my students most seem to prefer a personal photo but lots choose some other image (as I do, just to make sure they realize that not using a personal photo is a perfectly fine option at least in my classes). 5. Insofar as there are going to be external communications, they should be as useful as possible, containing designated name and designated avatar of the contributor, as much of the content as is practical, with a link that goes directly to that item in the system (not just to the top of that discussion board). The option to reply via the channel used would be a big plus! 6. Notifications should be mirrored internally when there are external communications (go to a page with all notifications, much like at Twitter, G+ etc. ), and when there are (for institutional or instructor constraints) no external communications, that internal notifications page is even more essential. Okay, time's up. That is my 15-minute contribution to the world of Canvas today. For other thoughts (esp. about the static profile pages), see the post that started this discussion: Thoughts about Choosing, Change, and the 800-Pound LMS Gorilla. We need to learn to look at things from different angles. Otherwise, we are going to continue to have LMSes that everybody uses ... but which are far less useful than they could be. 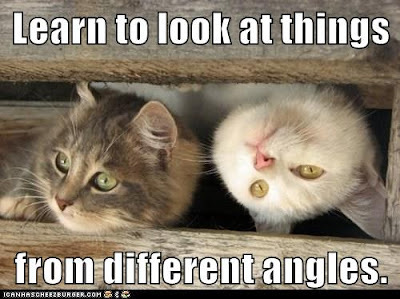 Learn to look at things from different angles. 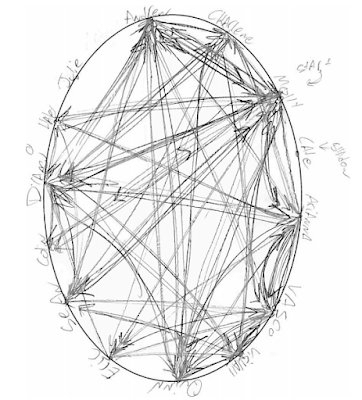 I kept thinking about Aras's sociograms from the hangout today, and I realized that I had seen something similar, but done manually, for face-to-face classes: it's something called a Harkness table. So I'm writing this up to share with Aras in case it is new to him, and also just to share because it is pretty cool. I don't teach in a classroom anymore, but I think this would be a great experiment. Isn't that cool? There is a Wikipedia article about Harkness tables too! 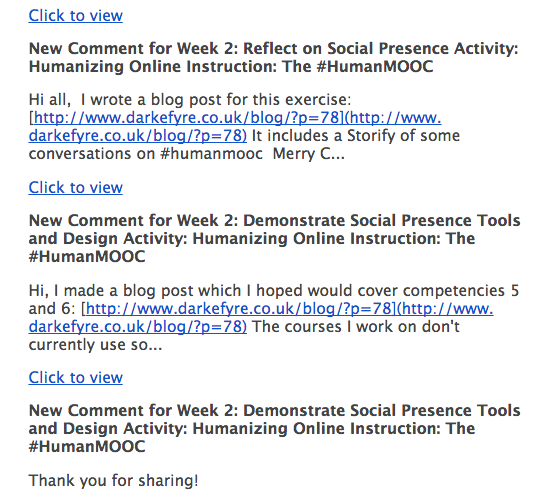 The Week 2 topic for #HumanMOOC is social presence and community building. There's been some great social present via the #HumanMOOC hashtag at Twitter, so I wanted to offer as a resource to share for Week 2 the TWITTER BOOTCAMP that I am working on right now for a January Academic Technology Expo at my school. I hope the materials and activities can be useful to people who have never used Twitter before and even for people who use it a lot. I use Twitter a lot, and I am also learning new things all the time from other users. So... if you have never used Twitter or have a dormant Twitter account, you might find the Bootcamp useful in developing a fun and productive Twitter presence in conjunction with #HumanMOOC. The materials go step by step, starting with the basics of Twitter (Stage 1 and Stage 2), some recommended tools and add-ons (Stage 3), and then a Twitter project — building a Twitter widget for your LMS or blog (Stage 4). You can contact me with any questions you have (@OnlineCrsLady), and you can also ask your #HumanMOOC Twitter Buddies (see below for more information about that Twitter list). And... if you are a regular user of Twitter, you might find some new tips and tools in the Bootcamp materials. 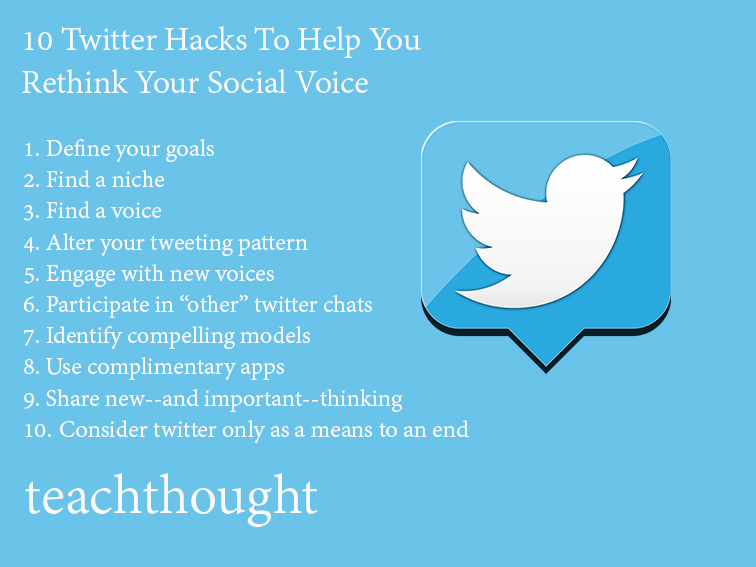 Even better, you could help me out by sharing YOUR favorite tips and tools, the key ingredients that have made Twitter a useful social learning space for you. Please comment anywhere with your input — the Bootcamp takes the form of a blog so you can comment on the posts there, or you can comment at this blog post, or at Twitter! #OUTechExpo AND #HumanMOOC. The materials have a University-of-Oklahoma focus (that's where I work), and they are designed for our Technology Expo in January, so that's the #OUTechExpo hashtag that you will see mentioned. Yet I am sure we could make good use of these materials for #HumanMOOC also — just jiggle the instructions in your mind, substituting #HumanMOOC for #OUTechExpo. WILL YOU BE A BUDDY? If you are already using Twitter, you could help others in #HumanMOOC to get started in using Twitter and building their personal learning network. I'm making a list of Twitter Buddies for #HumanMOOC, and if you would like me to add your name to that list, that would be super! Being a "Twitter buddy" should not be much work; it's really just about being willing to follow people while they are getting started, replying to their tweets, sharing ideas, and answering questions. You can see the growing list of HumanMOOC Twitter Buddies below. And THANKS in advance for any feedback people might have about the Bootcamp materials. All 40 posts are done, more or less (I just finished a couple of days ago on the first drafts for them all), and I am working hard on polishing them in time for my school's Expo in January. Some of the posts are in pretty good shape, and some still have gaps. Let me know if there is anything at all that is not clear or not working, and I'll try to be quick to fix it! Meanwhile, I use Twitter every day and it's an invaluable tool for my own learning and also for my teaching. I hope it's something that can be useful for you too! BUDDIES WIDGET. 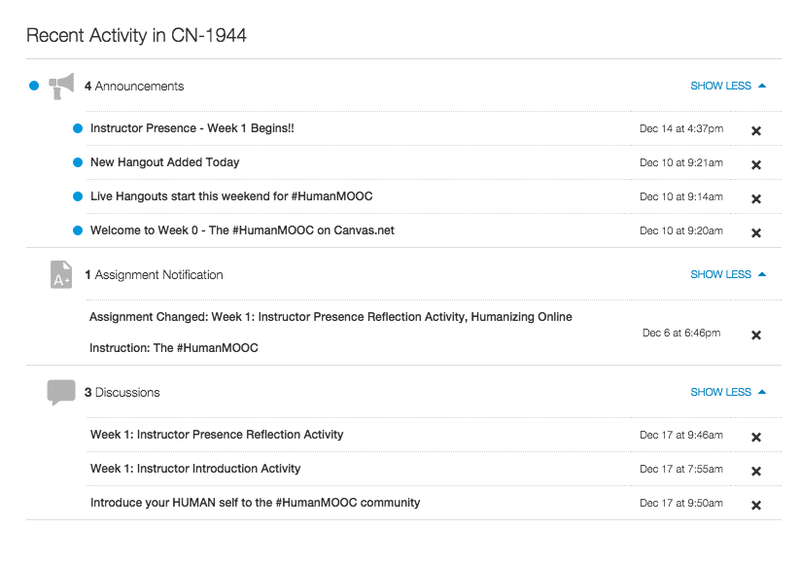 Below is a widget with the #HumanMOOC Twitter Buddies list. The widget shows their most recent tweets; here is the Members list. 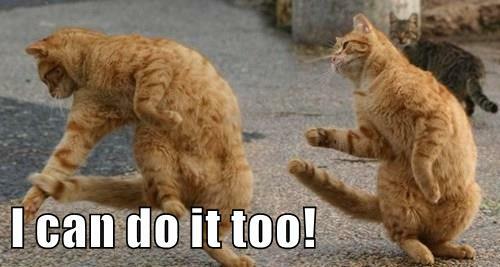 Want to be a Twitter Buddy? Just let me know (@OnlineCrsLady). Notice that this list is not just people's #HumanMOOC tweets; instead, the widget displays all their tweets (except for replies). That way you can see how people are using Twitter not just for the course experience, but in other ways too! The discussions going on during Week 1 of #HumanMOOC were really stimulating for me; the idea of presence is one that I think about a lot since I teach fully online classes. What I'd like to share in this post is the way that CREATIVITY can create a strong presence, as strong as or even stronger than a video presence. When I share something with the class that I have made, I am sharing a part of "myself," something produced by my imagination and thus something uniquely my own, something that is "me" — not literally me, but intrinsically me! I was thinking about this evening as I updated my "Growth Mindset Cats" widget, adding to the widget the cats I created in November and December. 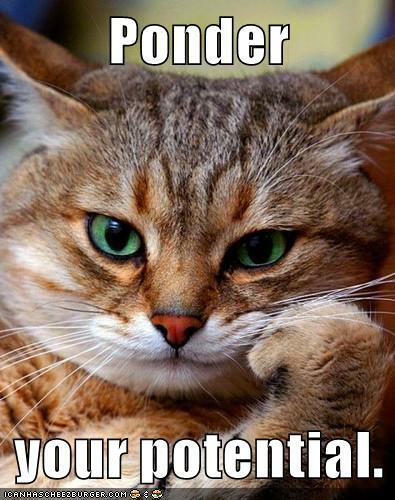 You can see that whole project at the Growth Mindset Memes website, and you can see the widget here; it displays a growth mindset cat at random, and there are over 100 of them now since I have been making them pretty steadily since back in June. 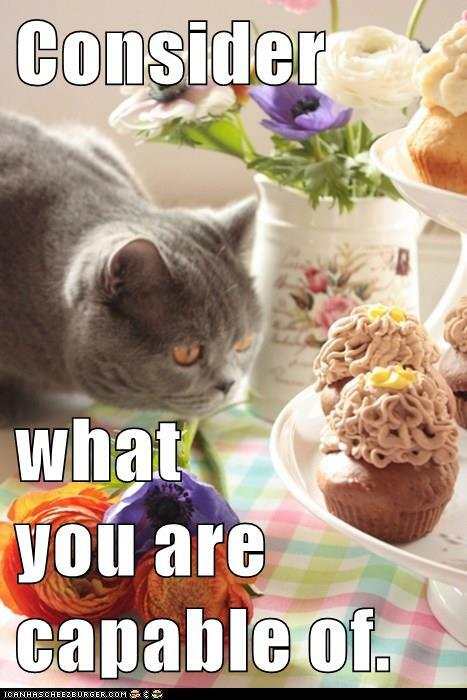 If you are looking at this via the blog hub, the widget may or may not be functioning, so I've also pasted in one of my favorite cats below. 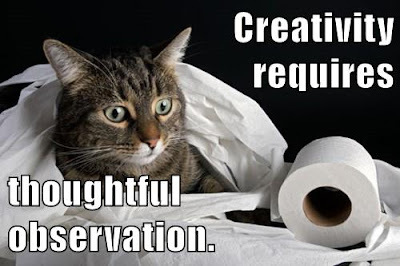 And, since these cats have a growth mindset, they are in touch with their creative side, as you can see here. 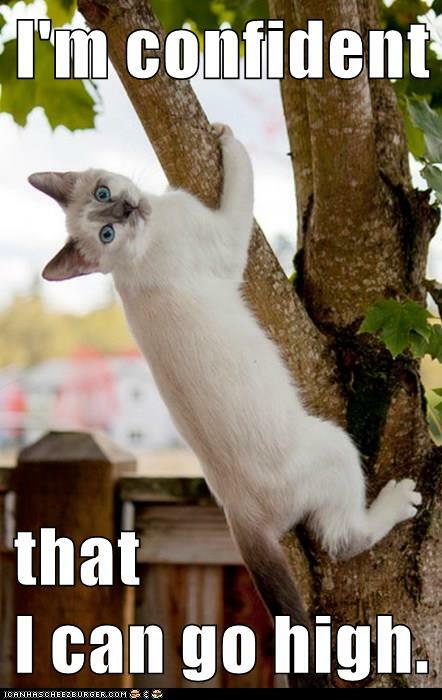 This cat is a great example of collaboration, in fact, because the words I used to create the cat meme came from a student's blog: one act of creativity leads to another! So, the more I look at the dichotomy behind the dual-layer MOOC, the more puzzling (and offputting) I find it. Here's a quote from a post I found at EduGeek Journal that explains the idea in detail (there is no author byline, so I am not sure who wrote it): Words That Don’t Work: Courses as Neutral Zones. Apparently, the idea behind the "stream" is that the stream is totally controlled by the instructor: "When a learner can look at two pathways, one that is controlled by the instructor and one that is controlled by themselves, they have to make a conscious choice between two different power dynamics. They may not be able to understand the nuances of instructivism and connectivism, but they can understand enough to choose between following the instructor’s prescribed pathway and creating their own pathway." I am no doubt one of those people who doesn't understand the "nuances" of instructivism and connectivism ... but I can see that this design model assumes there are times when learners give up their natural freedom and cede it all to the instructor. And to that, I say: ouch. As I explained in a tweet in a convo about this topic yesterday: The space to make choices exists because LEARNERS ARE FREE, not because you "give" them space to choose. Stream or garden, whatever metaphor you want and whatever course design you use, learners are free agents. They are going to do what they do because they choose to do so, not because you "tell" them to. And just like in life, all choices have consequences (a.k.a. karma). Some of those choices may play out in the design of the course (i.e. grading, if the course has grades), but the more important consequences of the choices play out in the learners' lives. Are they missing out on something that would be really valuable to them later? Or just choosing not to jump through a hoop for a grade? It's all choices all the time, and to create a model that seems to assume it's good for students to give up that freedom of choice at any time for any reason does not fit with my teaching philosophy. But cuique suum, to each his own. After reading the EduGeek article, I can see why the Canvas course is meant to be impervious to the outside, with a strictly top-down, instructor-driven design. But setting aside the content side of the course, here's what makes me really sad about the Canvas space: the students' Profile Pages are not a way to see what people are doing and learning inside this "stream" experience. In the year 2015, I would have expected that Instructure had learned something from Facebook, Twitter, and Google+, etc. about creating dynamic content on those Profile Pages, showing all our contributions to the class across the different course areas, but zip zero nada. How can students get to know each other if when they click there is nothing but a few static links on the other person's Profile? How can they follow each other and be learning buddies together in a course? I want to go find people and see their contributions, and then go join in discussions with them, but those Canvas Profile pages don't show what people are doing in the course ... much less letting students design their own Profile pages with a look/feel that reflects the identity they want to create and share online. So, I have to ask: where is my "student presence" at Canvas? It's definitely not being shared there on the Profile page, which means I cannot effectively connect with other students, not in a really useful way so that I am learning from others right there on the Profile page. As a result, I prefer not to participate in Canvas... but when I choose not to participate in the Canvas class, that choice does have consequences, and they are not good consequences: if the goal of a class is for people to learn and then share what they learn (and that, at least, is always my goal), by walling things off separately, we are losing out on many possible opportunities to be learning from each other. And, as I said: ouch. Just based on the garden/stream metaphor, I had thought the dual-layer MOOC had more to do with Mike Caulfield's vision of both gardens and streams as highly dynamic spaces — The Garden and the Stream: A Technopastoral — with the stream being a user-centered series of events: "the Stream replaces topology with serialization. Rather than imagine a timeless world of connection and multiple paths, the Stream presents us with a single, time ordered path with our experience (and only our experience) at the center." But students are definitely not at the center of Canvas, at least not in the so-called "stream" of the HumanMOOC course (maybe there are other design options; I wouldn't know). Mike rightly raises concerns about the strengths and weaknesses of content that takes shape in the context of a person-centered stream, but Canvas has no learner streams; this is NOT the stream of the technopastoral. Just labels, no content of any kind. Now, compare that sad screenshot to what the #HumanMOOC stream looks like at Twitter. I think you can see why I can learn much more there at Twitter ... and I'm here to learn, and share what I learn. 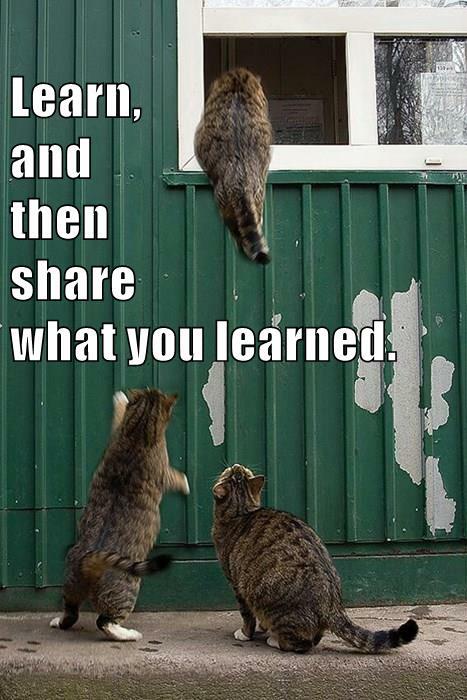 When I retweet, I spread the learning through the network... including my own PLN beyond the MOOC. To me, that's where the power lies: multiply the learning, hoping it will go far. In Canvas, alas, there seems to be nowhere for the learning to go. 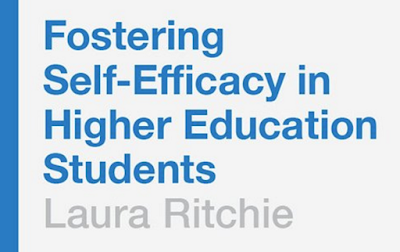 As I explained in an earlier post, one of my projects for winter break is writing up a review of Laura Ritchie's new self-efficacy book: Fostering Self-Efficacy in Higher Education Students. Moving on to Chapter 2! (Here's Chapter 1.) My comments are in italics. Microcosm: such a great metaphor! "Each student brings his or her own unique dynamic to a situation, with a microcosm of personal attributes, beliefs, and experiences the teacher may never see." Privacy AND empathy: both important! "Allowing for individuals certainly does not mean probing students' personal lives to understand their perspectives. However, it is important to acknowledge that the student's decisions, thinking, motivation, and achievements are based on a multifaceted web of self-beliefs." I really like how self-efficacy zooms in on specific tasks; mindset is more global. "Self-efficacy beliefs are, by definition, specific to a named task. [...] Moreover, these beliefs are malleable." More on task-specificity: "A person's understanding of his or her value as an individual is separate from the self-efficacy beliefs based on capabilities to carry out named tasks. [...] A student's overall self-concept is a global trait and, as such, is less relevant to any specific teaching context." 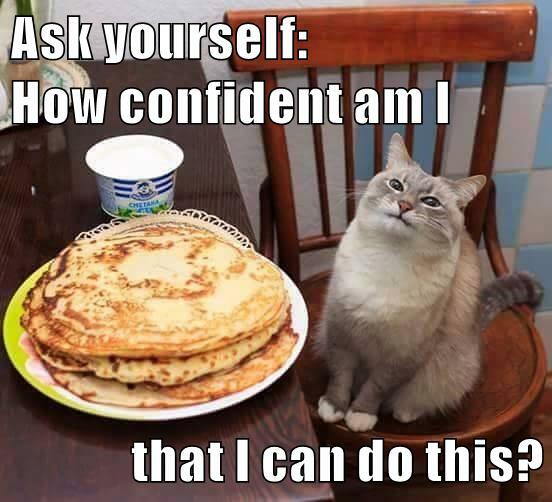 The self-efficacy question: "How confident am I that I can do this?" Ask yourself: How confident am I that I can do this? Bandura's early self-efficacy work was in psychotherapy, overcoming fear of snakes; I really like that since I see fear as the most negative emotion students face: "Each person had a unique and personal belief about their capabilities to do the different tasks based on self-judgments made at that point in time." The task-specificity makes this hard to research: "A generalized study tends to miss the mark and measure self-concept or a more generalized view rather than the very specific self-efficacy beliefs." Snapshots is a great metaphor for the specificity: "Looking at self-efficacy beliefs is like viewing snapshots of people's self-judgment of their confidence in capabilities at that moment." This is the key element: "The most meaningful and lasting way to impact self-efficacy beliefs is through personal experiences. When someone takes on a task and completes it, they achieve what is called a mastery experience. [...] Each task, whether micro or macro, can represent a mastery experience." Vicarious experiences are HUGE for my classes (seeing other students' writing, blogs, websites): "A learner has a vicarious experience when observing others accomplish tasks." It's powerful: "Vicarious learning can be effective when introducing completely new material or when rebuilding students are less than successful experiences. 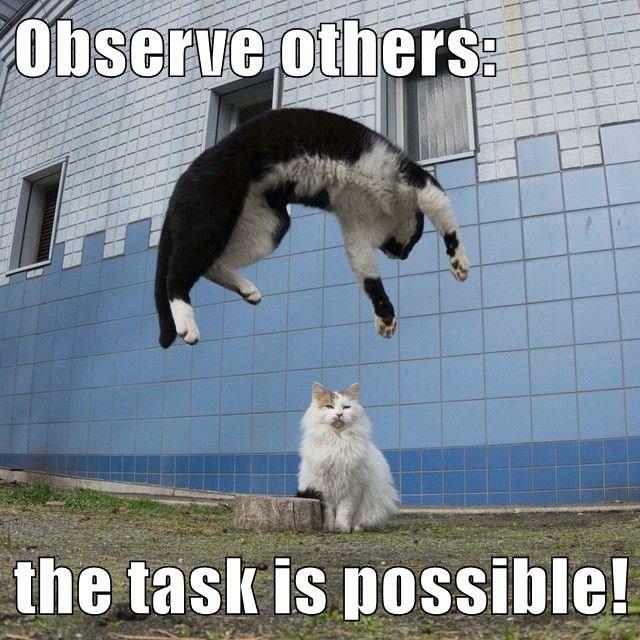 [...] Watching others can communicate a sense that the task is possible." 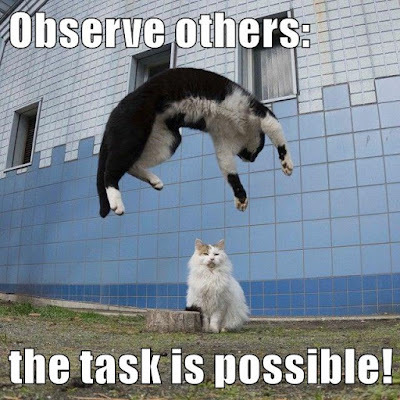 Observe others: the task is possible! Like vicarious experience, this dimension is less powerful than mastery: "A mastery experience will supersede both observations and what other people say in encouragement. Verbal persuasion alone is not an effective way to form or influence self-efficacy beliefs, and the effects of verbal feedback tend to be temporary." Very much growth mindset here: "Learning and feedback that treat ability as an acquirable skill use self-comparisons [...] and focus on the self and achieved progress has been recommended for building self-efficacy." Lots of interesting stuff here, but not as relevant to me... and reassuringly: "This is the least influential factor on a person's self-efficacy beliefs." More mindset talk here: "People who have high levels of self-efficacy also tend to exhibit a range of positive qualities. They are more likely to choose more challenging tasks, undertake strategic thinking, work harder, exhibit resilience, and attain higher outcomes. [...] Failure is less of a deterrent, and they use resources creatively and seek possible solutions before giving up. Overall they persist longer and achieve more." 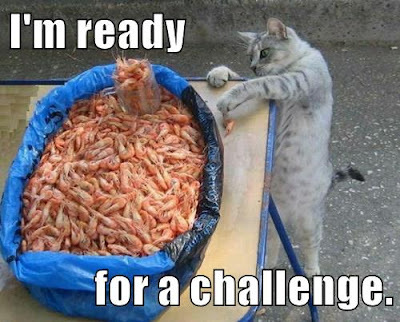 I'm ready for a challenge. I'm confident that I can go high. More mindset (esp. relevant to feedback): "It is possible to break through the mindset that someone can't learn by demonstrating to them that they have already learned." 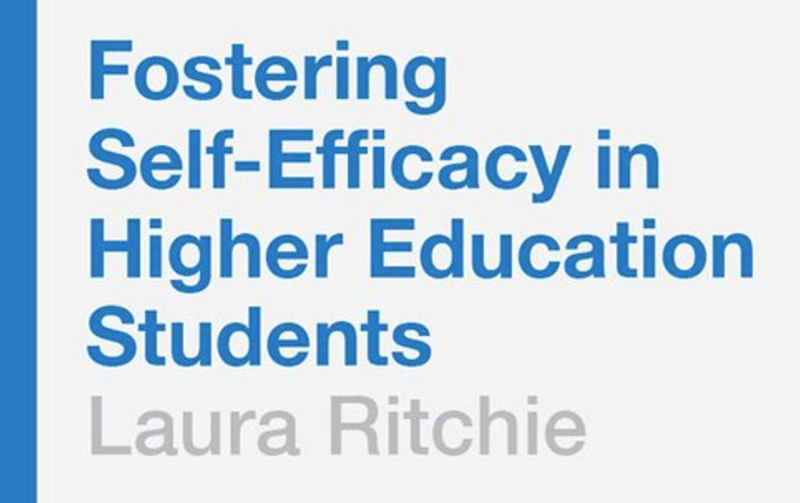 Some students need that more than others: "The processes of reflecting and reassessing help self-efficacious people to take on more challenging tasks with continued confidence; they focus strategically on how to use their skills to achieve success." 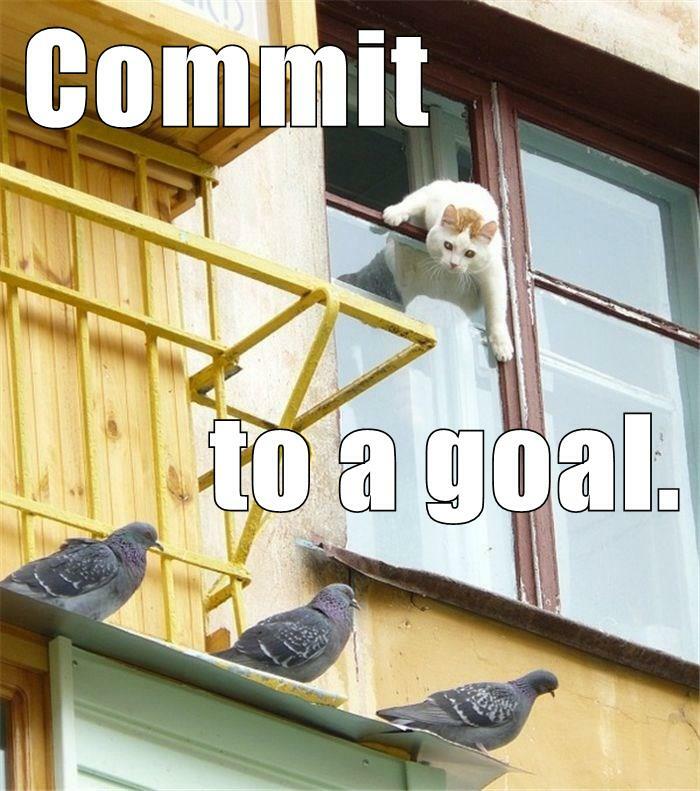 It's a cyclical process: "Committing to a goal is partly determined by self-efficacy, and the actions that follow are also sustained by these beleifs and lead to achievements, which are the basis for future judgments about self-efficacy." I really like this ideal: "an ideal learning situation where students consciously take responsibility for the processes of monitoring, reflecting, and eventually achieving their potential." 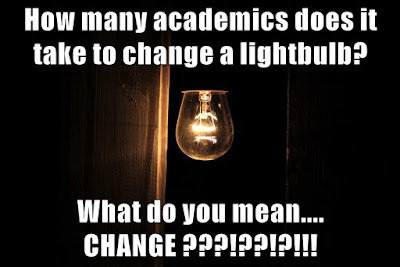 Learning v. assessment (I am glad my focus is almost entirely on learning): "the need to distinguish self-efficacy for learning and performing in academic settings." Learning v. performing: "Making judgments about self-efficacy for learning requires the student to consider their capabilities for acquiring new skills [...] Self-efficacy for performing involves beliefs about executing a task successfully by using skills that have already been learned." Consider what you are capable of. Instead of test-taking skills, self-efficacy! "Everyday materials and activities can help teachers shape students' practical understanding of how self-efficacy for performing beliefs can influence and impact achievement." 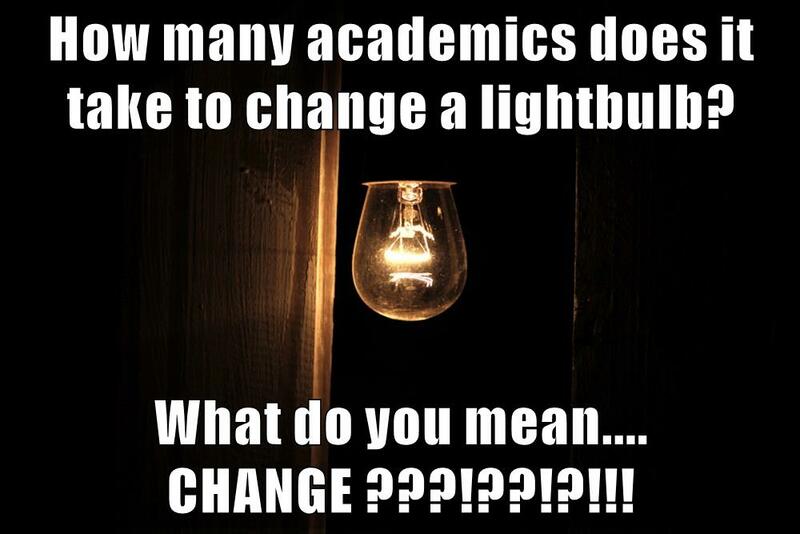 This reminds me of the "teaching writers" graphic! "The difference between a young violinist and a student in a lecture is that the violinist is viewed as a young performer from the outset, from first playing 'Twinkle Twinkle,' whereas the student sitting in the third row back might only be thought of as a student who is in the class for the semester." So little time in the classroom! "The influences that build self-efficacy beliefs are in themselves simple, and to be effective, experience with them needs to be frequent, merited, and reinforced. This can be a challenge in a teaching setting when time and contact with students is limited." It's not hard! "How often do teachers actually tell students that they believe they will succeed? This affirmation is important as a beginning point." 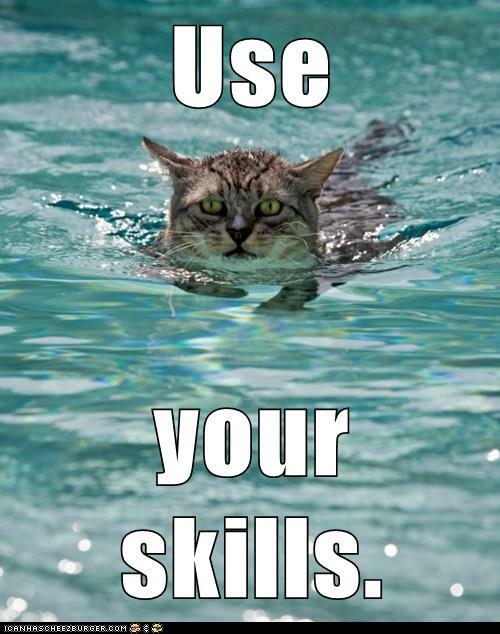 Focus on skills is also welcome! "Assignments do not need to be easy; however, the students need to either have a budding awareness of the necessary skills and methods, or understand how to source the skills they need." Also: self-reflection. "Self-efficacy for learning can be developed through methods that encourage the student to observe their processes." Self-awareness! "Teachers can iterate goals to students in a way that helps them to break down the ongoing process of learning and acknowledge that efficient use of time and capabilities is an achievement just like any other task." Good points about how performance is a task of its own, with associated self-efficacy beliefs: "The skill of delivering information in this way, of 'performing' that task, may not have entered into the taught content of the course." 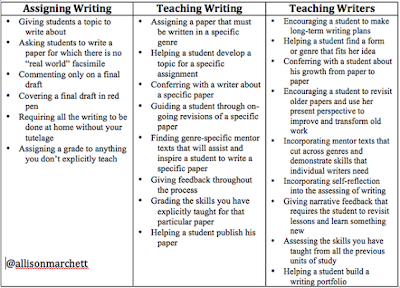 Performance without assessment — all writing can be considered performance (esp. when it's not about taught content): "Essay writing is perhaps the easiest to integrate as an assignment that has the scope for making students active participants in the reflection process." * There's no Kindle version, alas, so I cannot rely on highlight and search. * There is so much good stuff here, I can't pick out the best without seeing it all laid out. * I want to make cats! So I will need the quotes later for cats. So, this week I'll be posting my highlighted notes chapter by chapter, and then I'll be able to write up a proper review next week. I'd like to put one up at Amazon, GoodReads, etc. The book is expensive (eeek! ), so I'd like to provide information in a review that would encourage faculty to get their libraries to order a copy. To start: the Preface and Chapter 1! My comments are in italics. Just like with growth mindset, self-efficacy is something of importance for both teachers and students: "Self-efficacy beliefs are at the core of every action that we all, whether teacher or student, undertake." I'm going to be esp. interested in Chapter 7: "Chapter 7 challenges all of us to continue to develop our self-efficacy through learning, teaching, and professional life." Also this: "There is no one, single answer that provides a definitive guide for how to foster these beliefs in all situations. Teachers are challenged to be active, demonstrating learning by being learners themselves, and working to allow themselves to be seen by their students as positive examples, not only as teachers but also as learners." I am really impressed by this performance metaphor: "Academic work, including teaching and assessment, is like a performance that requires preparation and rehearsal." I very much appreciate this warning about tests: I don't want to teach people to pass a writing test... I want to teach them to be writers! "The pattern of instructional teaching, imparting information and testing students on it, can create a culture where people learn to the test, and they also learn for the test. After the test, the students will feel accomplished, and wait for the next test. It can be like a dog that does tricks; it behaves well, but it needs to be led by the trainer. What happens when the trainer is gone? When the student leaves the institution? That halo effect from the leader will dissipate, and what is the student left with?" Along with the idea of performance, LR emphasizes the idea of mastery: "When students achieve mastery, it must be something that they have done in their own right, with a sense of ownership and belief." The goal is deep learning: "Deeper learning calls for something to come from the student: an impulse, or creativity of thought." 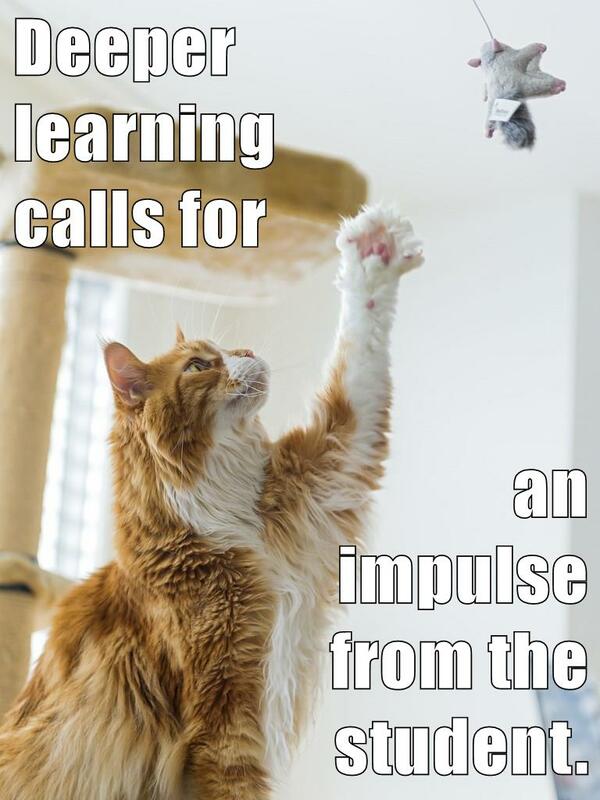 Deeper learning calls for an impulse from the student. 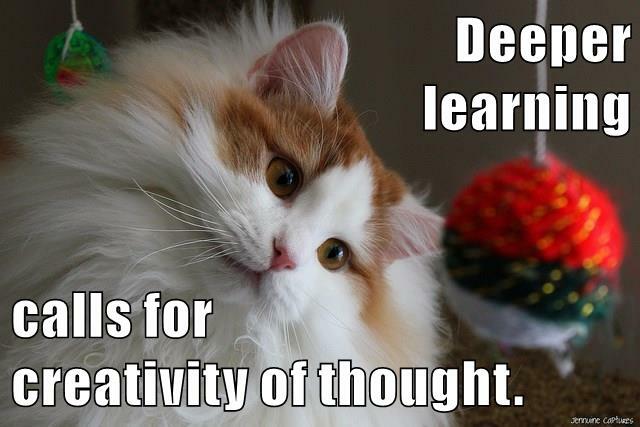 Deeper learning calls for creativity of thought. I also really like this idea of space, a metaphorical space: "For students to be in a position to engage with these key concepts in their learning, there needs to be space; space for them to respond to an impetus, to question, and to explore. 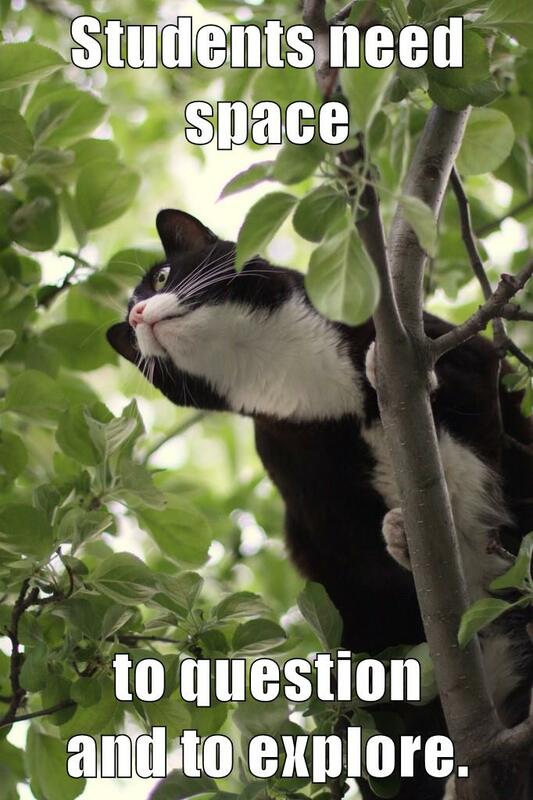 Students need space to question and to explore. LR compares a pianist's performance to an exam: "Considering academic work as a performance can encourage a shift in perspective. Once something is taken on board as a performance, it makes sense to prepare, and having a structure for building that confidence towards the achievement is likely to produce better results." I really like the idea of open-endedness as a feature of excellence: "Excellence fosters the individual and allows for each to grow and develop their potential, as opposed to becoming a product of a predetermined process. Again the idea of giving students space, room: "In the most stimulating settings, that encourage active, individual engagement, there is room for students to think, contribute to building content, and to have sense of personal agency in their learning." Open-endedness, yes, but preparation is crucial too: "The expectation that goes with excellence, that students will create something surprising or of exceptional quality cannot be done without developing the required skills and demonstrating self-assuredness." The perils of tests and quizzes: "When aiming for the right answers, some of the freedom, independence, and autonomy that comes with play is not taken, but is schooled out of them." Passivity: one of the worst aspects of schooling IMO. "This can create a culture where students believe that they can and should be passive while their teachers deliver education to them." Oh, it does sound ideal: "In an ideal situation, students would have access to the raw materials that guide them to develop independence and become confident, autonomous thinkers." Technology emerges in the discussion about facilities; I like looking at facilities in terms of student AGENCY: "By taking responsibility, having purpose, and believing in their actions, students ultimately will be in a position to shape the technologies they use, instead of allowing technology to shape them. Without this outlook, the empowerment of having information at students' fingertips is false, as they are not being empowered to creatively use their own agency." 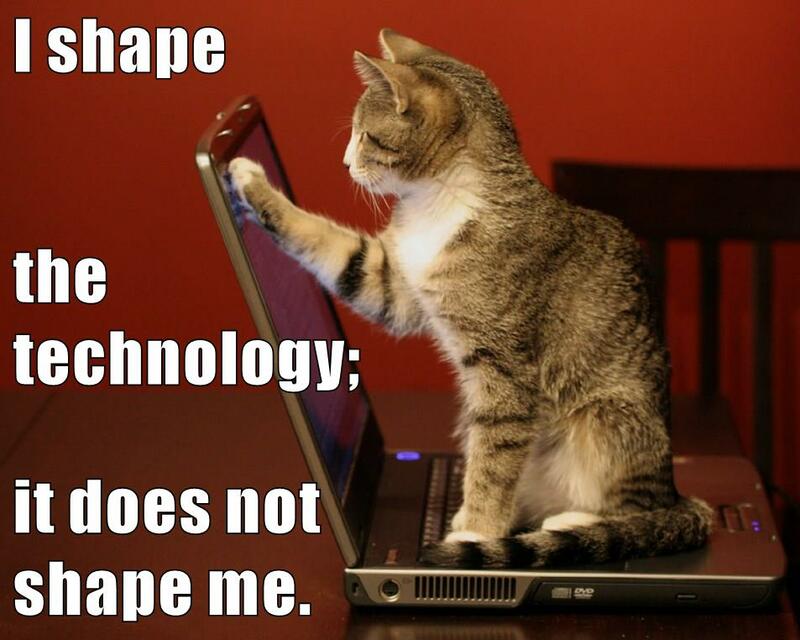 I shape the technology; it does not shape me. Ideas about what I would call growth mindset are starting to emerge here — especially risk-aversion. "Students can be reluctant to engage with what is new if it is perceived to be overly difficult or if it threatens their sense of security." LR describes Jonathon Worth's interest-driven photography course (I am such a fan of JW! ): "The student who wanted to pursue wedding photography would have a different task to someone interested in becoming an archivist, and the photojournalist would have yet another task." At the same time, a common goal: "With this level of diversity, there needed to be a common goal to unify the students. The photography class as a whole shared a vision that each person's pursuit was an "exit strategy;" their goal went beyond the physical assessment material and related to their lives." The librarian metaphor suits me so perfectly! "The technologically connected classroom is information-rich, but information and meaning seldom come bundled together. The teacher's role becomes to curate and contextualize this information. Teachers are librarians." And back to agency again: "When the student experience is at the center of the teaching, they can each personally develop a sense of agency and their capabilities in ways that empower them and reinforces their self-beliefs." Not hierarchical, but mutual: "Fostering students' self-beliefs in their confidence and capabilities is built on an investment and connection with students' journeys as they explore and develop their learning and performing processes through skills, goals, and experiences." So, here's some info about my "Twitter Bootcamp" project for those of you participating in #HumanMOOC. I would be really glad to hear from #HumanMOOC participants about this project (see requests below), and I would also be really happy if this could be a useful resource for anyone in #HumanMOOC who has not been using Twitter who would like to give it a try. The Bootcamp materials are designed with a focus for my school (University of Oklahoma) and our upcoming Academic Tech Expo on January 15 (#OUTechExpo), but just substitute #HumanMOOC where I've got our OU hashtag, and voila: it's a #HumanMOOC Twitter Bootcamp. FOUR STEPS. The idea is to walk people through some Twitter basics (Step 1 is done; I'm working on Step 2 now), then some Twitter tools and add-ons (Step 3... I'd love to learn about other tools people use; still tentative list), and then a Twitter project (Step 4); since we use D2L at my school, the Twitter project I'm going to focus on there is adding a Twitter widget to a D2L course homepage, although Twitter widgets can be adapted to all kinds of other uses (in other LMS, in blogs, websites, etc.). With BUDDIES! Hopefully, the people publicizing our Expo will be publicizing the Bootcamp also (it's different than anything we've done for the Expo before, since it's totally asynchronous and in the open), and I'm also going to try to run a "Buddy" system too. For the Buddy idea, during the week of January 4, I'm going to contact the serious users of Twitter at my school (there really are not that many), and urge them to find one other person in their workgroup who is not actively using Twitter right now and offer to be their "buddy" while they are doing the Bootcamp activities. Of course, I am going to be a "buddy" to anybody working through the materials also, but I was thinking it would be really good to have a buddy who actually knows you, who shares your specific professional interests, etc. #HumanMOOC Buddies too. Meanwhile, for #HumanMOOC, I am glad to be a Twitter buddy to anyone who wants to work through these activities during the #HumanMOOC event; since I am spending this winter break at home, not traveling, I'll probably do a good job of keeping up with the #HumanMOOC hashtag at Twitter. DIIGO. I'm also working on collecting Twitter sources in a Diigo. My use of Diigo is kind of chaotic, but for this I am trying to be super-organized, so I plan to tag everything carefully and add descriptions. You can see what I have collected so far here: Diigo - Twitter. * If you are new to Twitter and want to give the Bootcamp activities a try, that would be great; let me know what you think! You can comment on any of the blog posts or tweet me @OnlineCrsLady (or send me an email if you prefer: laurakgibbs@gmail.com). 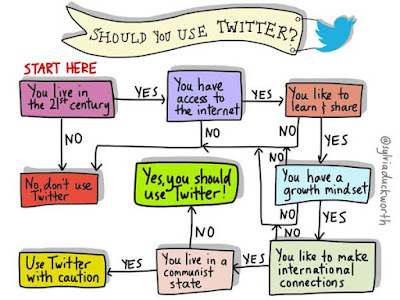 * If you are a Twitter pro, let me know what strategies have made Twitter a success for you! I'd also be really grateful for ideas about what tools and add-ons to focus on; I'm not really that adventurous myself, so I'm relying to some extent here on what I see my friends online using successfully; my own use of Twitter is pretty mainstream. 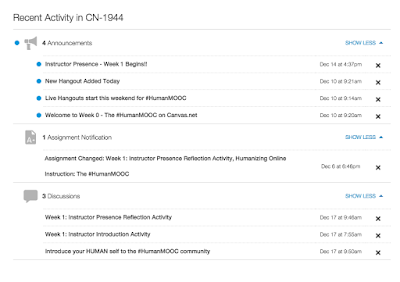 * If you have Twitter resources to recommend that I can add to my Diigo Library, that would be fabulous: if you tweet those with the #HumanMOOC hashtag, that would work. So far I've been doing pretty well at keeping up with #HumanMOOC hashtag.